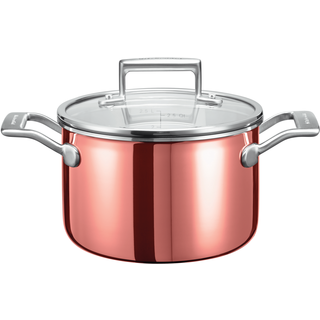 Kitchen Aid has continued to deliver cookware products of quality craftsmanship, while making use of the latest technology and packing it into a timeless design, as can been seen here with their 3 ply copper cookware range. There is no denying the beauty and the lifetime life of a shining copper pan and better yet they are fantastic energy savers. It does not matter what type of heat source you use in your kitchen, if your cooking is done in copper pots and pans, then there will be plenty of savings for you. Hot spots are pretty much unheard of in copper pots and pans, and very precise heats can be reached in a matter of minutes. You can change the temperature on your stove top, and in turn, the temperature of the pot changes almost immediately allowing you to braise and brown foods to perfection.